Bringing the Warhammer universe to action RPGs for the first time, Chaosbane aims to mix hack-and-slash with the universe’s rich lore to create something special. While games set in the Warhammer (and to an extent, 40,000) franchise were traditionally fairly niche titles, Vermintide and its sequel proved that approaching the fantastical worlds Warhammer offers in the right way can lead to great gaming for everyone to enjoy. 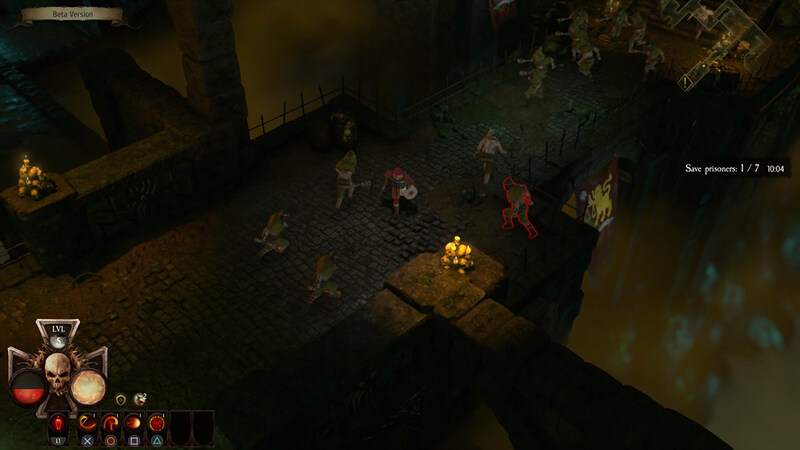 This summer, Chaosbane hopes to follow in those footsteps with an action RPG ready to help people scratch that oldschool Diablo itch. I’ll admit, I was a little skeptical about a Warhammer ARPG at first, as it’s a genre that’s tough to do well — games often focus on either playing well but lacking complexity and diversity (Diablo 3), or having a variety of playstyles at the cost of juggling a number of convoluted systems (Path of Exile). 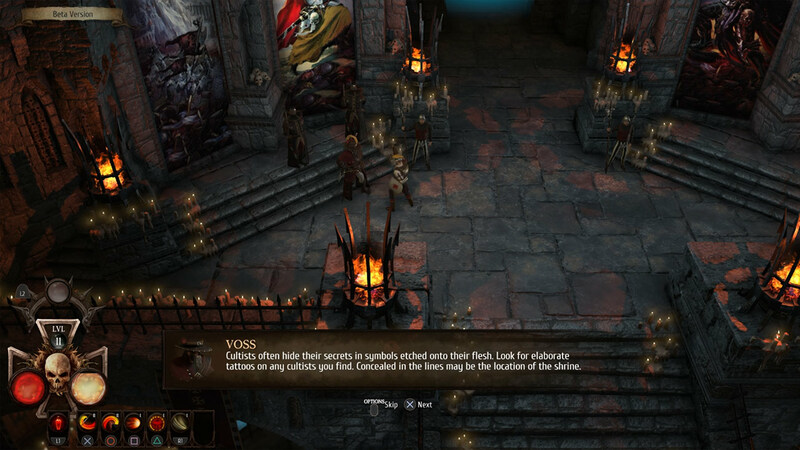 That’s why when I started playing Chaosbane last week, I was pleasantly surprised. The game is careful to hit a nuanced middle ground between being easy to pick up and start cutting swathes through enemies, and having an interesting variety of possible builds to accomodate your preferred playstyle. Chaosbane offers four different characters to play as, each representing an archetypal class and designed to work harmoniously with each other. The imperial soldier acts as a tanking class, able to safely withstand heavy blows and shrug off swarms of monsters, an ideal pairing with the high-elf mage who focuses on controlling and exploding crowds with large-area spellcasting. The dwarven slayer is a typical barbarian class, empowering himself the longer he remains locked in combat with foes, while the wood elf scout prefers sniping mobs from a distance with poisoned arrows, traps and summoned pets. Each character also has a bloodlust state, which gradually builds from collecting rare blood drops from slain mobs. Triggering bloodlust locks out equipped abilities, replacing them with special high damage skills that often replenish health as they cut foes down. The drops are uncommon enough that a mission will only typically let you trigger bloodlust once or twice, so it’s best saved for boss fights and perilous sections you may have trouble navigating. While I’ve only had a chance to play as the soldier for now, I’ve sunk a good few hours into the game and can safely say that difficulty tuning is currently hitting a good spot — with new gear and abilities you certainly feel stronger, able to brush past mobs which were previously troublesome. 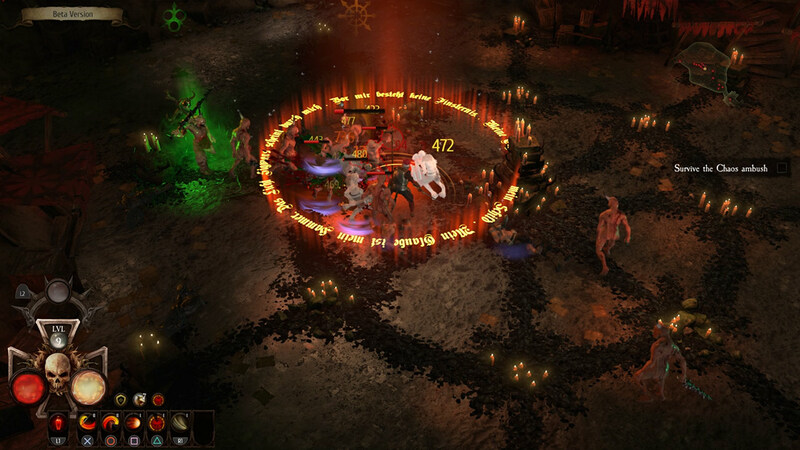 Hacking and slashing has a decent feel, being satisfying when mowing down scores of monsters, though it currently lacks that particular visceral “oomph”, the real feeling of powerful blows crashing down, that Diablo does so well. Chaosbane offers six equippable active skill slots from a large pool of fifty-something available skills, as well as another three slots for passives of your choice. 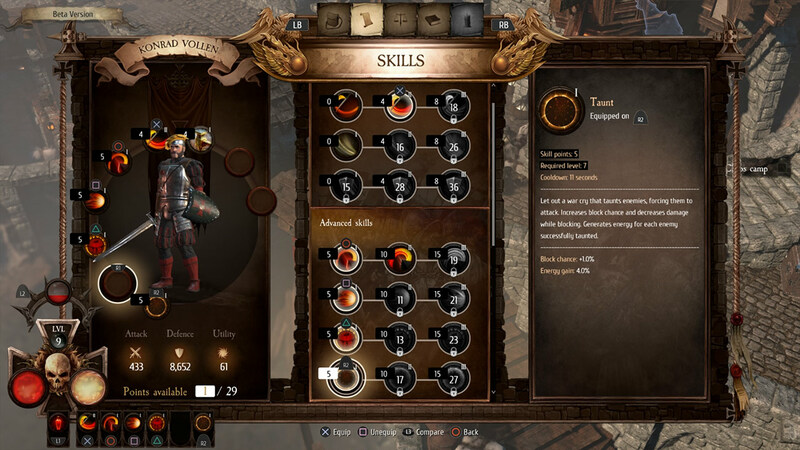 Each ability costs a number of skill points to equip, with stronger versions of each skill becoming unlockable as you level up. Ability reliance on having enough points to equip things means that you’re not always equipping the strongest version of each skill; you may choose to equip a weak version of one ability in order to have enough points to also equip another, complementary skill. A genre staple is, of course, loot — and thankfully Chaosbane also approaches this well. Loot drops off of mobs and from chests at a steady rate, and comparing current gear to new drops is easy given that character stats are pared down to just outgoing attack damage, defenses, and the admittedly vague “utility”. Unwanted items can be donated away to the Collector’s Guild in return for increasing your reputation with them, offering progressively stronger rewards each time you fully max out your reputation bar. Warhammer: Chaosbane currently has a closed beta running for those who have pre-ordered the game, full details of which are on their website. We’re currently having a great time with the game, and look forward to seeing how it evolves up to full release.